Day 0, October 8: Departure from the US in order to arrive in Johannesburg on October 9. Day 1, October 9: Arrival in Johannesburg. Some participants will be coming from our Mozambique tour, which ends in Johannesburg on October 7. Others will arrive in Johannesburg today, have departed the US on October 8. You will be met at the airport and transported to a nearby hotel for a much-needed rest after your long flight. Day 2, October 10: We will fly from Johannesburg, South Africa to Antananarivo (Tana), Madagascar. Time permitting we will visit Lac Alarobia (Parc de Tsarasoatra), a 66-acre bird oasis near the center of the capital, where we will have our first encounters with some of the Malagasy birdlife. Dimorphic Egret, Madagascar Kingfisher and various duck species are common. Squacco Heron and Madagascar Pond Heron occur side by side and makes for easy comparison. We have even recorded Eleanora’s Falcon here. Day 3, October 11: We will depart Tana after an early breakfast for today will be mostly a traveling day as our next destination, Ranomafana, is quite a distance away. We will, however, have the odd-stops for birding along the way. Day 4, October 12: We will have a full day to explore Ranomafana. Ranomafana means hot/warm water, which refers to the hot springs in the area. The park was originally proclaimed to protect the Golden Bamboo Lemur, first described to science in 1987. Birds that we will be on the lookout for include the elusive Brown Mesite, Forest Rock Trush, Wedge-tailed Jery and Pollen’s Vanga. Pitta-like Ground-Roller is also fairly common. The higher elevation forest is home to the localized Yellow-bellied Sunbird-Asity, where we may also locate Rufous-headed Ground-Roller, Brown Emutail, Rand’s Warbler and Cryptic Warbler. Day 5, October 13: Another full day around Ranomafana, one of Madagascar’s largest parks. The morning will be dedicated to forest birding and we should find birds such as Blue Coua, Yellow-browed Oxylabes, Grey-crowned Greenbul and, with huge amounts of luck, we might spot Madagascar Cuckoo Hawk. After lunch we will visit the Vohiparara marsh for Meller’s Duck, Madagascar Harrier, Grey Emutail, Madagascar Snipe and the very rare Slender-billed Flufftail. We will constantly be on the lookout for the 12 known species of Lemur that occur here as well as a myriad of Chameleons and other reptiles and amphibians. Day 6, October 14: Today we will be driving from Ranomafano to Isalo National Park via the Horombe Plateau, a distance of about 366 kilometers, which will take us about 6 hours of comfortable driving to reach. Our primary target bird here is Benson’s Rock Thrush, but there are many other good birds including Madagascar Sandgrouse, Madagascar Partridge and Madagascar Harrier. We will spend the afternoon birding around our overnight stop at Relais de la Reine, located between the town of Ranohira and Isalo National Park. Day 7, October 15: Depending our success with Benson’s Rock Thrush, we might head straight for the Zombitse Forest where we will search for one of the world’s most localized birds, the Appert’s Greenbul. A variety of other dry, deciduous forest species are present including Giant Coua, Crested Coua, Madagascar Harrier-Hawk, Ashy Cuckoo-Shrike, Long-billed Greenbul and Madagascar Buzzard. The extremely rare and elusive Fosa, Madagascar’s largest predator, has also been reported from here. Day 8, October 16: We have a very early start to our day as we head for the “coral rag scrub” at La Table, here we look for the localized Verreaux’s Coua and the recently discovered Red-shouldered Vanga, before returning for breakfast. After breakfast we head for the island of Nosy Ve via the Onilahy Delta where we might find Humblot’s Heron and Greater Flamingo. Nosy Ve is an uninhabited islet with a breeding colony of Red-tailed Tropicbird that are very confiding. Other attractions include Crab Plovers and numerous waders. Snorkeling is another famous pastime here and we might opt for this if the group would like to spend a bit of time in the water. Back on the mainland we will stop at Anakoa for Littoral Rock Thrush, which is regularly recorded here. Day 9, October 17: We will depart St. Augustine and head for Tulear where we will bird the mudflats around Tulear before lunch. Species that we might see include Saunder’s Tern, Lesser Crested Tern, Lesser Sand Plover, and Bar-tailed Godwit. Both Greater and Lesser Frigatebirds are seen here from time to time. On the way to Ifaty we will stop to bird some wetlands where Greater Painted Snipe, Baillon’s Crake and Little Bittern has been reported. We'll spend the afternoon birding in the Spiny Desert around Ifaty for Long-tailed Ground-Roller. Day 10, October 18: We'll do some early morning birding in the Spiny Desert, with specialties such as Sub-desert Mesite, Lafresnaye’s Vanga, Archbold’s Newtonia, Thamnornis Warbler, Banded Kestrel, Sub-desert Brush Warbler, and Running and Green-capped Couas. The Spiny desert is home to numerous reptiles. We should see the fairly common Three-eyed Lizards and may be lucky enough to find a beautiful Spider Tortoise or rare Dumeril’s Boa. After breakfast we head back to Tulear where we will catch our flight to Antananarivo. Depending on the exact time of the flight we might pay a visit to Tzimbazaza Zoo or perhaps another visit to Lac Alarobia for some last minute birding. Day 11, October 19: From Tana we fly to Mahajanga and then drive to Ankarafantsika National Park. The camp offers comfortable chalets and the restaurant serves traditional Malagasy fare. We will encounter our first campsite residents such as Lesser Vasa Parrots, Crested Drongo, Madagascar Magpie Robin, Sakalava Weaver, Madagascar Hoopoe and Madagascar Green Pigeon, not forgetting the ever present Coquerel’s Sifaka. At Lac Ravelobe, only a stone’s throw from the camp, we will look for the critically endangered Madagascar Fish-Eagle that is known to breed here. White-throated Rails are also commonly found here. After dinner we will go on a night walk for some of the nocturnal birds and lemurs. Pygmy Kingfisher is often easier found at night than during the day. Day 12, October 20: We will have a full day to explore this remarkable area. White-breasted Mesites and Gray-headed Lovebirds are sometimes seen within the camp. We will make good work of exploring the splendid network of trails through the park. Eight species of Lemur can be found around the camp, including Common Brown Lemur as well as the rare Mongoose Lemur. The jewel-like Schlegel’s Asity will be high on our list of priorities as will Van Dam’s Vanga and also the two species of Coua found here: Red-capped and Coquerel’s Couas. Vangas are well represented and other than Van Dam’s we should also find Rufous, Hook-billed, White-headed, Chabert’s and Red-tailed Vangas. Reptiles are plentiful; fortunately there are no poisonous snakes on the Island. Oustalet’s Chameleon (the worlds largest) and Rhinoceros Chameleon are common in the forest. We’ll head back to Mahajanga in the late afternoon. On the way to Mahajanga we will stop at Lac Amboromalandy where we might find Humblot’s Heron, White-faced Whistling Duck, African Pygmy Goose and Hottentot Teal. Day 13, October 21: An early morning boat trip up the Betsiboka Delta promises to create much excitement - this is one of the only ways to find the rare Bernier’s Teal and also Madagascar Sacred Ibis. This is a great time to add some waders to our trip list, with Greater Sand Plover, Black-bellied Plover, Terek Sandpiper, Whimbrel and Crab Plover likely. We'll return to Mahajanga for lunch after a morning of birding, and then return to Ankarafantsika for some afternoon birding. Day 14, October 22: This morning we will try for any of the birds that we might have missed the previous day, and we'll also be on the look-out for Madagascar Crested Ibis, Madagascar Paradise Flycatcher and Sickle-billed Vanga. Madagascar Green Sunbird breeds in the camp and we will make another visit to Lac Ravelobe where we could find Mascarene Martin, Madagascar Jacana and Purple Heron before tackling the long drive back to Anatananarivo. Day 15, October 23: This morning we will waste no time in departing for Analamazoatra Special Reserve, better known as Perinet. During our full day birding Perinet Reserve, we will be looking for Red-fronted and Blue Coua, Velvet Asity, Madagascar Blue Vanga, Nuthatch Vanga and Red-tailed Vanga. The thrill of birding in Perinet would not be complete without hearing and seeing the world's largest living Lemur, the Indri. The spine-chilling howls of this creature is an experience you will not soon forget. Other birds to be on the lookout for include Madagascar Wood Rail, Madagascar Cuckoo, Madagascar Spinetail, Tylas, Nelicourvi Weaver, Souimanga Sunbird, Common Sunbird-Asity and Madagascar Cuckoo-Roller. What would a visit to Perinet be without a nocturnal outing? After dinner, we will embark on an unforgettable evening in the forest, watching for nocturnal Lemurs and birds. Possibilities include Long-eared Owl, Rainforest Scops Owl and both Madagascar Nightjar and the rare and little-known Collared Nightjar. 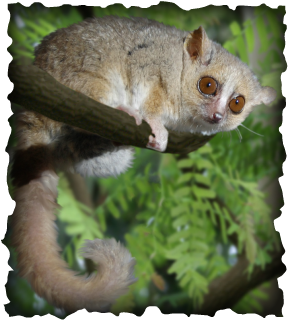 On the Lemur front, we hope to find the nocturnal Eastern Woolly, Greater Dwarf and the diminutive Brown Mouse lemurs. Day 16, October 24: We will bird Mantadia National Park, which is undoubtedly the finest place to find Ground-Rollers in Madagascar. Four of the five Ground-Rollers are found here, the only exclusion being the Long-tailed Ground-Roller. Some of the more difficult to see specialties at Mantadia include Red-breasted Coua, Madagascar Serpent Eagle (very rare here and better seen at Masoala), and the incredibly scarce Red Owl. More common birds include Greater and Lesser Vasa Parrots, Madagascar Starling, Madagascar Blue-Pigeon, Madagascar Flufftail, Madagascar Little Grebe, Madagascar Pygmy Kingfisher, Forest Fody, Ward’s Flycatcher, Crossley’s Babbler, White-throated Oxylabes and many more. The elusive Diademed Sifaka and Black-and-White Ruffed Lemur are present here. Day 17, October 25: We will spend the morning at one of the two reserves we've birded, depending on our target list. Some time around midday we will depart for Anjozorobe (approx. 244 km, 4-5 hrs.). There is a possibility of finding France’s Sparrowhawk and Madagascar Lark en route. Day 18, October 26: Anjozorobe comprises the largest intact remnants of Madagascar’s highland forest eco-system. Ten of Madagascar’s thirty three Lemur species are found here and birding is also very diverse. Top birds to be found in the forests are Red-tailed Newtonia, Grey Emutail, Grey-crowned Greenbul, Yellow-browed Oxylabes and Common Sunbird-Asity. At the wetlands we should look for the rare Meller’s Duck, Madagascar Snipe, Madagascar Little Grebe. Even the super-rare Slender-billed Flufftail has been recorded here. Other good birds that are possible include Henst’s Goshawk, Madagascar Partridge and Madagascar Buttonquail. Day 19, October 27: We have some time in the morning to bird Anjozorobe for any birds that we might have missed the previous day. We will once again visit some of the marshes in the hope of finding that ultimate Malagasy tick, the Slender-billed Flufftail. We will return to Tana in the afternoon, making sure that participants will be able to catch the flight to Johannesburg at 3:00 PM. Deposit of $950 with registration. Balance is due on or before June 9, 2016. Registration form may be downloaded from a link at the bottom of this page.